Home / Columns / AS I SEE IT – The Scariest Night in Wrestling History? AS I SEE IT – The Scariest Night in Wrestling History? Hell didn’t freeze over, as I suggested it might last week. Instead, we had what was likely the scariest night in wrestling history, or for that matter in live television, period. People looking for their three hours of escape were instead confronted with an off-screen battle of someone fighting for his life that they’d been listening to only minutes before. As anyone not living in a cave is well aware, Jerry Lawler suffered a heart attack while commentating at the Monday Night RAW telecast that was to feature the return of Bret Hart to Montreal, for the first time in a WWE ring since 1997. Jerry Lawler’s heart attack unfolded live as a tag-team match between the teams of Prime Time Players and Daniel Bryan/Kane, Arda Ocal, contributor to my PWBTS.com website indicated that he looked over to the broadcast table and saw Jerry Lawler hunched over, beginning to shake. It looked like he was choking. He may have vomited. Then, suddenly, he collapsed from his chair. Michael Cole gestured to the ringside cameraman nearby to “get away and get help.” EMTs flew to the ring to check on Lawler. Understandably, the live crowd (let alone the fans viewing on TV) didn’t know what was going on…but the silence in commentary signaled it wasn’t good. Lawler was then carried out by several EMTs backstage. The backstage area was cleared for EMTs to attend to Lawler. Lawler received CPR for 15 minutes, and was shocked as many as seven times by EMTs to bring him back. For a period of time, he was clinically dead. Lawler was then transported to a Montreal area hospital where he underwent an angioplasty and had a stent placed into his chest to remedy the blockage that caused his heart attack. Fans at the event live were not told specifically what had happened (as WWE did when Owen Hart fell to his death in 1999), but in an era of smartphones and social media, it likely didn’t take long for many to figure out and the word to spread. Fans viewing via TV live were told was had happened by Michael Cole, who twice interrupted the show, which continued without commentary. Pre-taped segments were run, and the show-closing promo were done, but odds are that not that many were paying that much attention. John Cena and Bret Hart clearly showed the strain of worrying what was going on, but delivered killer promos that we’d have been talking about all week…in different circumstances. Amazingly, despite the several minutes Lawler was been out, the immediate treatment he received was such that he appears to have suffered no brain damage, which had initially been feared. The news coverage this received seems amazing, given the limited universe wrestling has to the general public. Most mainstream news shows carried reports of the heart attack, as did entertainment shows. So did nearly every news or entertainment-related website. 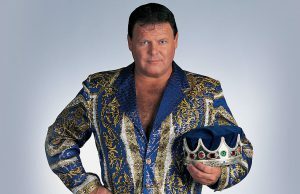 Only two days later, Lawler thanked the hundreds of thousands of fans, plus via WWE’s Tout, which can be viewed at this link: http://www.tout.com/m/rwwluj. We’ve all made great sport of the heavy-handed way WWE has used social media, at least at first, before they settled into a better use…but it was likely a Godsend for those looking for information in the chaotic hours following Lawler’s heart attack. There have been those who have been questioning Lawler getting into the ring at age 62, yet that seems to have been far less of an issue than him not watching his diet (other than women, his only vice seems to be Church’s Fried Chicken). But he did get some signs that something was going on during the weekend while working independent dates in Aruba with him feeling chest pains. While he dismissed the pains as indigestion, he had planned to see a doctor shortly. If this attack had happened while Lawler was in Aruba, odds are very good that he would have died. About the only thing that saved Lawler’s life was the prompt and skillful attention given by paramedics and WWE personnel onsite in Montreal. As far as what was taking place during the chaos that took place as Lawler was being taken backstage, we have to give Michael Cole a lot of credit. I’ve given Cole a lot of abuse in this column over the years. But Monday night, he showed the mainstream reporter he was (always referred to in gimmick as a “war correspondent”). Under his birth name of Sean Coulthard, his past career includes work for CBS Radio, covering such notable events as the 1988 Michael Dukakis campaign and 1992 Bill Clinton’s presidential campaigns, the Yugoslavian civil war in 1994, the white supremacist bombing of the Federal Building in Oklahoma City, and the 1996 Presidential campaigns of Steve Forbes and Bob Dole. Given what unfolded in front of him, and not knowing if his broadcast partner was alive or dead…he was a professional. Anyone else think Matt Hardy needs to surrender his “Stronger Than Death” gimmick right about now? Not to mention, who doesn’t think the most emotional return in wrestling history will be the night Lawler returns, whether to make an appearance…or to go back to work behind the microphone? ← Previous Story Do Not Disturb!